Dates of birth and death unknown. First record in the 11th lunar month of 1681: he performed as a kashagata in Ôsaka. His first stage name was Yamamoto Kandayû. He performed in Edo in 1697. 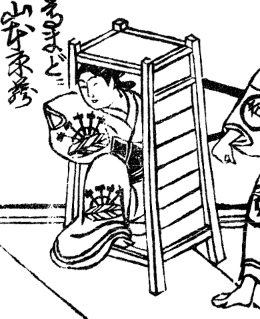 His rank in the 1699 Edo hyôbanki, kashagata section, was jô (superior) [visual]. He took the name of Yamamoto Kanbê in the 11th lunar month of 1700 at the Yamamuraza, playing the role of a tsubone in the kaomise drama "Yorimasa Mannen Goyomi". He went back to Ôsaka in 1704. He played in the 11th lunar month of 1710 the role of a kôshitsu in the kaomise drama "Shusse Yakushi Jûnishin", which was produced in Ôsaka by Arashi Sanjûrô I. He played in the same theater in the 1st lunar month of 1711 the role of Miuranosuke's wife in the drama "Sode Nikki". 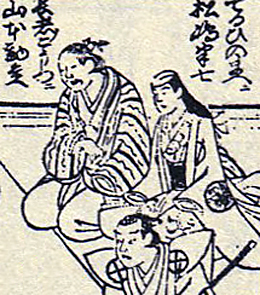 His rank in the 1711 Ôsaka hyôbanki, kashagata section, was jô-(shiro)jô (superior - (white) superior) [visual]. No record afterwards. He was the master of Yamamoto Hikogorô and Yamamoto Matsusaburô I. Dates of birth and death unknown. Disciple of Yamamoto Hikogorô, he started his career at the beginning of 1731. He became zamoto and produced in the 11th lunar month of 1732 at the Kita no Shinchi Shibai  the kaomise drama "Hana Yakata Imose no Matsukane". He went to Kyôto in Fall 1734, took the name of Yamaki Kyôzô and performed in the 11th lunar month of 1734 at Miyako Mandayû's theater in the kaomise drama "Tomi Yakata Kogane no Yaguruma", which was produced by Nakamura Tomijûrô I. He became wakaonnagata and zamoto in Kyôto, producing in the 11th lunar month of 1735 the kaomise drama "Ôkamado Miyako no Ichigura". He went to Edo in Fall 1737, along with his master Yamamoto Hikogorô and Kaneko Mantoku. He took back the name of Yamamoto Kyôzô and played at the Nakamuraza the role of Kokonoe in the kaomise drama "Soga Monogatari Osana Nikki". His master went back to Kamigata in 1740 but Kyôzô stayed in Edo. He played at the Moritaza in the 1st lunar month of 1747 the role of Yaoya Oshichi in the new year drama "Edo Murasaki Kongen Soga". No record afterwards. Also called Sakurabashi Ôshibai (Grand Kabuki at the Sakura Bridge).